Youll Discover All The Top Sites Where You Can Get Free Targeted Traffic To Any of Your Sites! But that is when you realize that there arent that many people that even know your site exists. But there is more you can do, and it isnt costly. And the best thing is, it can be a lot of fun, too. Not only have you gained a bigger customer base, but you have had the opportunity to meet and get to know your customers. So, with that said, Ive written a special report giving you everything you need to know about getting social media traffic to your sites. What exactly is social media and how you can leverage and milk it for everything its worth! How to target your audience the right way. Get this wrong and you would be wasting hours and hours of your time. Its better to find out exactly who your audience is first! 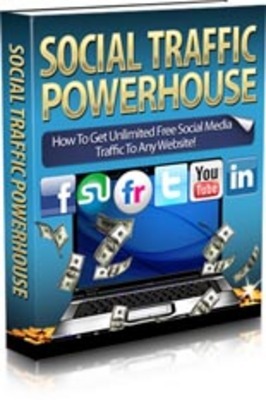 Facebook traffic tactics - with over 800 million users, why wouldnt you leverage on the power of Facebook? These tactics will show you Facebook tactics youll love. LinkedIn traffic tactics. LinkedIn is one of the most overlooked ways of generating traffic. Almost all business professionals have LinkedIn. You can reach them easily using LinkedIn. StumbleUpon traffic tactics. This site is one of the most popular social bookmarking sites. You can piggy-back on this website quickly & easily. Flickr traffic tactics. Yes, believe it or not, you can get a ton of traffic from photos!